On Tuesday, May 5, nine adults were confirmed to the Anglican communion. They were trained and lectured by The Very Revâd Dean Patrick Mc Intosh for the past two years; then, on Tuesday, they were presented to the Bishop to be confirmed. 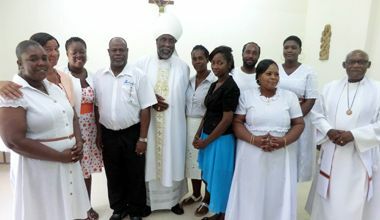 In attendance were other members of the clergy, along with parishioners from the parish of St George and St Andrew. A communicant member of the congregation accompanied each person to the Bishop, where the confirmand knelt before him, with the assistant resting his or her hand accordingly on the right shoulder of the confirmand. Immediately after, the Bishop proceeded to lay his hands on and confirmed the individual. The ceremony was held in the format of a Eucharistic mass, using much of the Confirmation Liturgy from the Book of Common Prayer. The proceedings lasted approximately an hour and a half.